Chris Wilder led Northampton Town to victory over his former club Oxford United to complete their remarkable escape from League Two relegation. The Cobblers trailed when Ryan Williams poked in for Oxford early on. But Williams saw red for kicking Ricky Ravenhill and Northampton swiftly replied through John Marquis's cool finish and an Ivan Toney header. Mathias Kouo-Doumbe headed in after the break to complete the comeback and keep the Cobblers in the Football League. 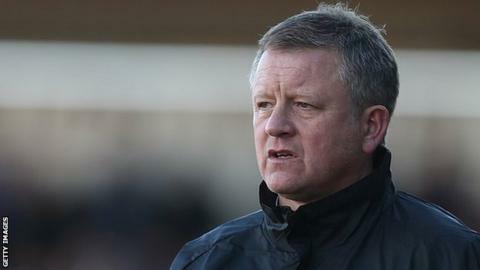 Since taking over on 27 January, Chris Wilder has picked up 28 points to steer Northampton to safety despite being six points adrift when he started the role. Wilder's side had been entrenched in the bottom two since September until last week's win over Dagenham & Redbridge lifted them out of the mire and this was another vital victory for Northampton who, with Wycombe having won at Torquay, would have been relegated had they lost. Eyebrows were raised in January when Wilder left Oxford to take over at the Cobblers, who were bottom of the league and six points adrift of safety. But he has managed to pick up 28 points since arriving at Sixfields, and this win against his former employers secured the Football League status of a club who were beaten in the League Two play-off final just one year ago. It started disastrously for the home side, as Williams got to Josh Ruffles's corner and nudged in from a few yards out. With Wycombe already ahead at Torquay, it meant Northampton were below the dotted line and facing relegation, but they almost drew level when Toney raced clear and struck the post. The game turned on its head with Williams's dismissal, as the Australian midfielder inexplicably kicked out at Ravenhill, and Gary Waddock's side, who have now lost eight of their last 10, were barely in the contest from that point. Since taking over in March, Gary Waddock has lost seven of the eight games he has been manager of Oxford United. With the Cobblers piling on the pressure, Chris Hackett twice went close before Marquis latched on to Toney's flick-on and stroked the ball into the bottom corner. Later 18-year-old Toney rose to head in Evan Horwood's cross for his third goal in two games and after the break substitute Kouo-Doumbe nodded in Hackett's free-kick at the back post to ease the nerves of the home support. The U's rarely threatened and could have been further behind had Jake Wright not managed to scramble back and clear Emile Sinclair's goal-bound effort. The Cobblers eased home regardless and the final whistle was the cue for hundreds of supporters to flood on to the pitch and celebrate a survival bid that seemed very unlikely four months ago. "I'm drained, but elated that we've retained our league status; I never wavered in my belief that this was a group of league players. "We're one of the form teams over the last few months. Some people said the club was dead and buried so the player deserve an enormous amount of credit and we're going to have a good night. "You don't want people jumping through hoops and saying it was a fantastic season - it wasn't. But we've kept the belief and the unity in the club has been unbelievable and I'm delighted myself and Alan Knill have played a part in taking us over the line." Match ends, Northampton Town 3, Oxford United 1. Second Half ends, Northampton Town 3, Oxford United 1. Hand ball by Chris Hackett (Northampton Town). Attempt missed. Callum O'Dowda (Oxford United) left footed shot from the centre of the box is close, but misses to the left. Chris Hackett (Northampton Town) is shown the yellow card. Tom Newey (Oxford United) wins a free kick in the defensive half. Scott Davies (Oxford United) wins a free kick on the left wing. Callum O'Dowda (Oxford United) wins a free kick on the right wing. Substitution, Oxford United. Tyrone Marsh replaces James Constable. Substitution, Northampton Town. Brennan Dickenson replaces Ivan Toney. Attempt missed. Emile Sinclair (Northampton Town) header from the centre of the box is too high. Foul by Ben Tozer (Northampton Town). Tom Newey (Oxford United) wins a free kick on the right wing. Attempt blocked. Emile Sinclair (Northampton Town) right footed shot from outside the box is blocked. Foul by Ivan Toney (Northampton Town). David Hunt (Oxford United) wins a free kick in the attacking half. Matt Bevans (Oxford United) wins a free kick in the attacking half. John Marquis (Northampton Town) wins a free kick on the left wing. John Marquis (Northampton Town) is shown the yellow card. James Constable (Oxford United) wins a free kick in the defensive half. Substitution, Oxford United. Callum O'Dowda replaces Dave Kitson. Matthias Kouo-Doumbe (Northampton Town) wins a free kick in the defensive half. Goal! Northampton Town 3, Oxford United 1. Matthias Kouo-Doumbe (Northampton Town) header from very close range to the top right corner. Assisted by Chris Hackett with a cross. Foul by Tom Newey (Oxford United). Zander Diamond (Northampton Town) wins a free kick on the left wing. Second Half begins Northampton Town 2, Oxford United 1.